“As a complete novice to yacht sailing, I was unsure of what to expect when I applied to Ex Arctic Express. I imagined a relaxing couple of weeks, perfect to unwind after my exams. 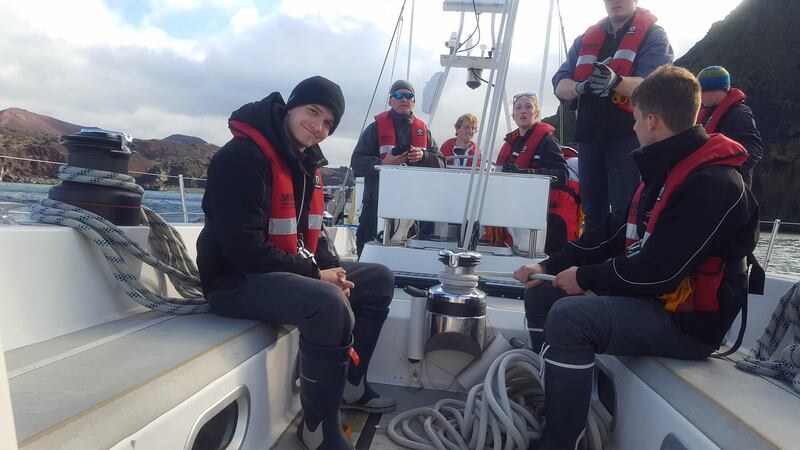 In June 2018, fifteen enthusiastic crew members from the University of London Officers’ Training Corps set off on what was to be a challenging and exhilarating voyage from the Scottish Hebrides al the way north to the windswept, volcanic island of Iceland. Among the crew aboard HMSTV Adventure, a seventy-two-foot yacht were several novices who would find the voyage far more testing, but also more rewarding than they could have expected. Exercise Arctic Express’ aim was to develop individual and team skills in a demanding environment, something that was unquestionably achieved. The voyage was split down into three distinct legs. 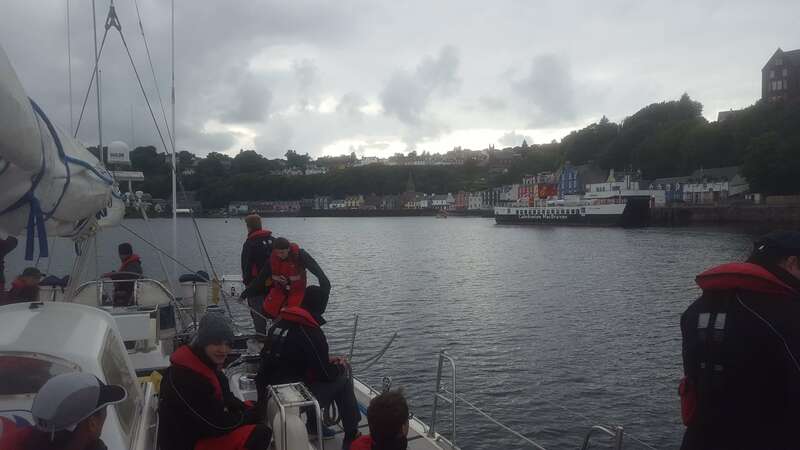 The first leg was a training phase, sailing out through the Hebrides in Scotland, arriving in Stornoway after three days of intensive training. The second was a passage directly north to the Faroe Islands, and the final and longest phase was to Reykjavik, Iceland via Vestmannaejar. 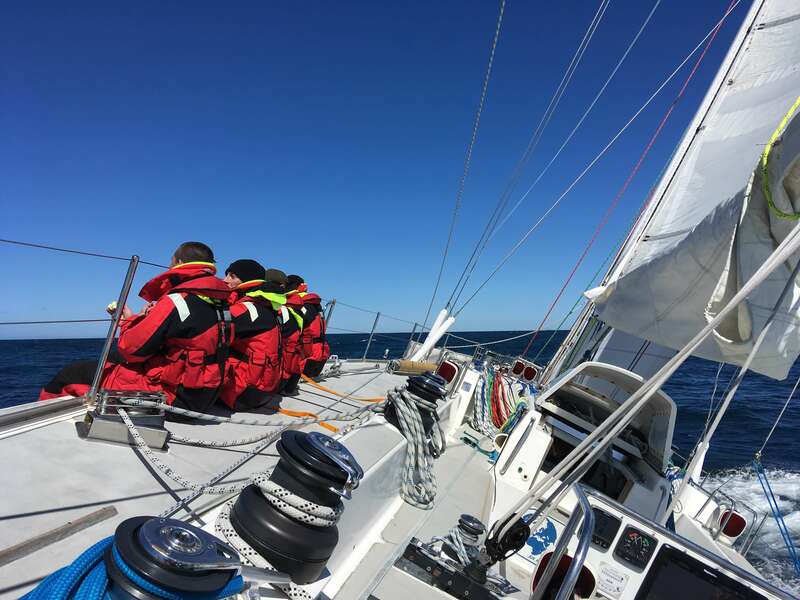 For many of the crew this was their first time sailing a yacht of this size, others had never sailed before. Regardless, all were familiarised with and trained on the vessel until it became a second home. As the expedition continued, the crew grew in confidence with each new hardship they overcame. Under sail, nature was not always on the side of Adventure, although conditions certainly were adventurous! Two major weather systems were encountered in the North Atlantic, a harrowing Force 10 (the infamous Storm Hector), followed by a still fearsome Force 8. The crew that drew alongside in Reykjavík bore little resemblance to that which had left Oban ten day earlier, having honed their skills in extremely testing circumstances. They learnt plenty about themselves as well as each other, with the biggest learning point being how people are capable of exceeding their own expectations by far. After a cramped 10 hour drive up to Scotland, the eager crew rushed down to yacht Adventure, clearly identifiable as the largest boat in Dunstaffanage marina. Having found our way through the maze of pontoons, we were greeted by the skipper, medic, and 2nd mate (who was up at the masthead!). Wasting no time, we set about stowing our belonging and the seemingly endless food for our two week voyage. Despite being relatively sheltered coastal sailing, the first leg of the expedition was in some ways the most strenuous. It was during this time that our crew, containing a large mix of ability and experience, was trained in the operation of the vessel. Even experienced sailors would learn that a 72’ yacht requires teamwork and a substantial amount physical effort to sail. On passage, the crew were split into three “watches” in order to ensure smooth running of the yacht. These rotated every 24 hours, with watches being either on or off watch for 4 hours at a time, or performing “mother watch” duties – cooking, cleaning, and making sure there were enough hot drinks to go around. Additionally, every crew member had a specific role such as bosun or sailmaker, so there were plenty of tasks to keep everyone busy. At this point the true scale of what lay ahead of us began to settle in; this was certainly not to be some pleasure cruising around the Solent. Up bright and early, we spent the next morning perfecting our coming alongside drills – in effect, “parking” the extremely large and somewhat unwieldy boat. Once the skipper was satisfied, we slipped from Oban and headed out into the Sound of Mull. We were a little taken aback at the amount of crew needed to raise the mainsail as six people hauled on the halyard to hoist the huge amounts of canvas skyward. The two foresails were equally arduous as they had to be dragged out of the forepeak and prepared prior to being hoisted. The next ten hours were spent completing evolutions of sail hoists and changes until they were second nature. It was a more tired, but infinitely more capable, crew that arrived in the pastel coloured town of Tobermory. After an amusing mix-up with our tenders we established that we had blown up the wrong one and quickly brought out the other to be tested. Another 15 minutes and a polite conversation with some Naval cadets later we had the outboard attached and even fuel for it. Well tested the crew took to bed, thoroughly tired out. 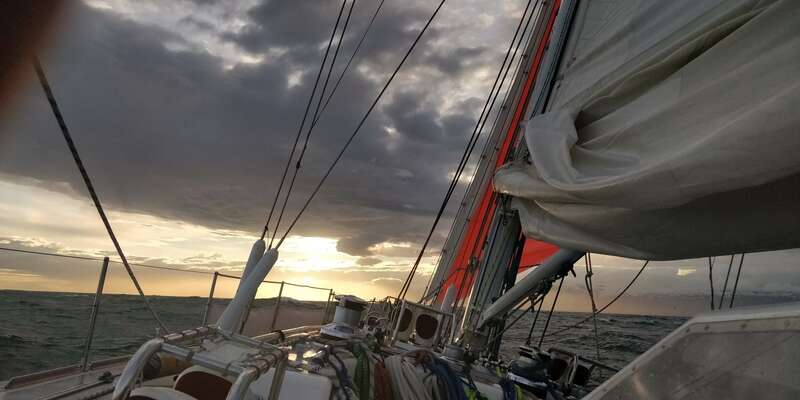 After an early start the next day, it was much of the same for the crew of Adventure, with seemingly endless evolutions to prepare us for the rigours of ocean sailing which lay ahead. We struck out purposefully towards Loch Harport, dodging lobster pots as we were greeted by the unmistakable silhouette of the Cuillin Ridge (and the Talisker distillery). We spent the night as anchor in the Loch, having made a brief run ashore. The anchor worked as intended, dropping smoothly down into the depths, its silvery wedge biting into the muddy sea floor holding us in place. The next test for Adventure was a sail through the Outer Hebrides to Stornaway on the Isle of Lewis. As this was a slightly longer passage, it gave the crew a taste of life in the watch system that was to become their daily routine. It was almost dark by the time the welcome sight of Stornaway edged over the horizon. While in Stornaway we met a civilian crew who were following the same route as us to the Faroe Islands. However, they were planning to wait out the forecasted bad weather as they judged it too extreme. Unsurprisingly a little apprehensive, we left the shelter of the Hebrides for the open sea. 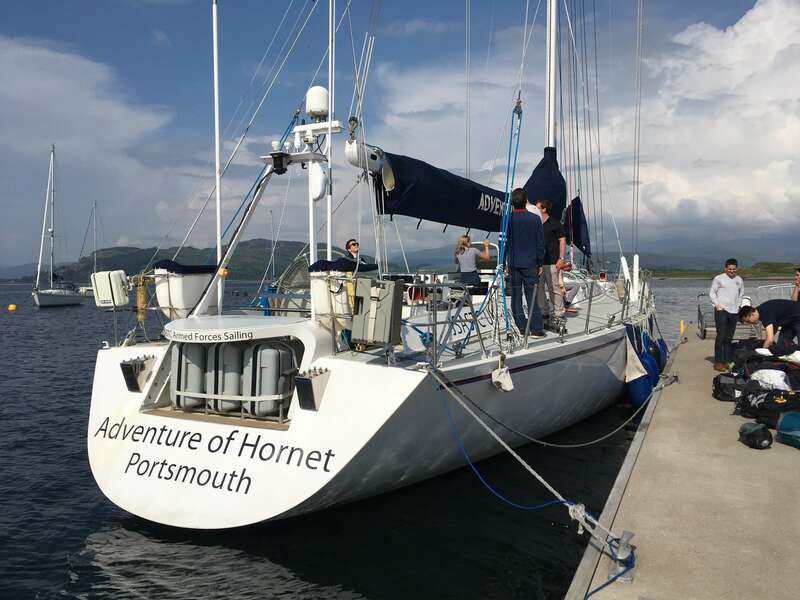 Although conditions were decidedly fresh, it was all plain sailing until we drew level with the northernmost tip of Scotland, when Storm Hector made an appearance. The wind increased gently, allowing us to work our way through all the sails and reefs in the main. The foredeck was especially exciting (and nauseating for most); those deployed to lower the foresails ended up drenched, swamped by waves which swept even large men off their feet. 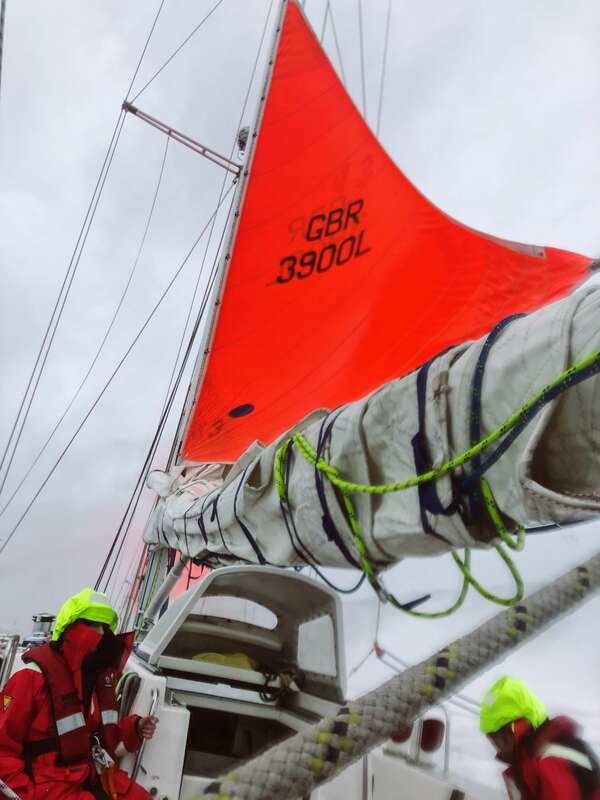 This continued until, as the wind rose and the high wind alarm began blaring, the decision was made to raise the storm sails, an eventuality we had prepared and practiced for during our training. In the high wind it took four men to drag the foresails down to the deck, being lifted off their feet at times. Our hard work during the first leg paid off and, even flying just two tiny orange sails, Adventure charged onward to the Faroe Islands. We reached the Torshavn harbour still sailing under our storm sails. The effects of the storm had taken their toll, and the crew learnt new sailmaking skills as damaged sails and fittings were repaired. Although proud of their work, the crew were all too aware it would have to withstand more of nature’s wrath. During our time in the Islands we visited a military museum, which focused on Faroese involvement in the Second World War. It was enlightening and showed a side of the war rarely touched upon. 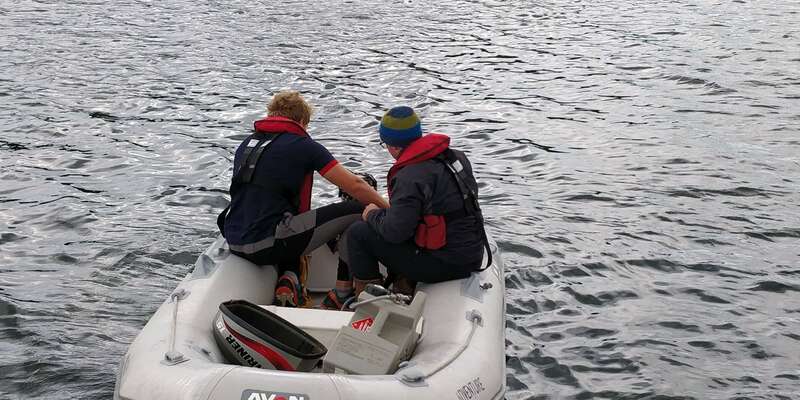 Boat repairs complete, we set sail from the Faroe Islands the next afternoon in initially very light winds – the complete opposite of our arrival. As we sailed out of Torshavn Harbour, we crossed paths with the civilian vessel from Stornaway, only now arriving. Upon being asked why we would leave a safe-haven during a storm, the reply was: “Our yacht is called Adventure for a reason”. With high spirits, we began our longest passage yet to Vestmannaejar, a tiny Icelandic island. We sank back into our familiar watch routine, during which time seemed to pass twice as quick. As we closed in on our destination the winds picked up once again to gale force, although not quite as bracing as those we experienced during Storm Hector. 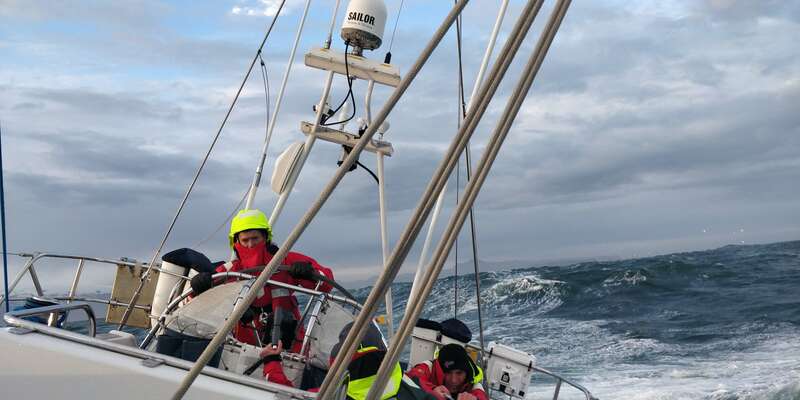 While some of the crew were feeling the effects of mal-de-mer, others were sent forth to the foredeck to make sail changes while being soaked by breakers. Having finally made landfall and completed our boat tasks, the crew scattered, unsteady on their sea legs, to explore every nook and cranny on the island. We scrambled up the striking hills and volcanoes, rewarded with views of the whole island, and the fallout from the recent eruptions; even to the shores of Iceland where our journey would end. All aboard took advantage of the local thermal pools, soaking the bruises they had earnt tumbling around as we sliced through the waves of the North Atlantic. That same evening, wasting no time nor the good sailing breeze, we left the beautiful island and set our course for our final port of call: Reykjavik. The crew were now treated to the frustrations of sailing to windward, taking a forty-mile detour in order to round the headland for Reykjavik. Although watching the majestic glaciers disappear from view was disheartening, their reappearance was all the more exciting for it. Finally sailing into Reykjavik harbour as the fantastic midnight sun dipped, the crew were almost too exhausted to realise that our journey was about to end. Once ashore, we wasted no time absorbing the natural beauty of Iceland, from black sand beaches, to waterfalls, to a hot spring hidden deep in a valley. Following a crew meal which put our burgeoning culinary skills into perspective, and a comprehensive clean out of the yacht, we explored Reykjavik as much as the crippling exchange rate (and time) allowed. It was with heavy hearts that the crew of Adventure, more close-knit than ever, headed to their flight home. Arctic Express was to most, if not all, of the crew an incomparable experience. All were challenged, not only by the otherworldly and unfamiliar environment of the ocean and the physical demands of big boat sailing, but also by the less obvious task of working with others in such a close, focused space. 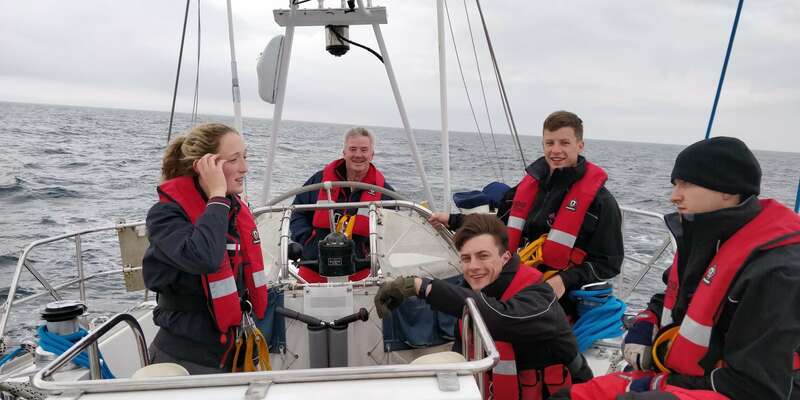 The exercise was without a doubt a resounding success, with all the novices having been awarded their Competent Crew qualifications vowing to continue and expand their sailing repertoire. Aboard Adventure we developed not only our sailing ability, but also our teamwork and leadership skills in conditions more arduous than many would face. Ed Duffy took part in this expedition and wrote a personal account of his expeiences. Read Ed’s story. The crew step foot on Adventure for the first time. Lines are prepared for arrival at Tobermory. A watch leader delivers a lesson on weather. The foresails are winched in whilst the second mate helms. The second mate and watch leader attempt to repair a broken outboard. As Storm Hector builds the oncoming watch prepares themselves. In 50 knot winds the orange storm-sails are finally up. Storm-sails raised again as a Force 6 gale batters Adventure. The crew learn about the Faroes in the Second World War. The off-watch relaxes in good weather off the Icelandic coast. 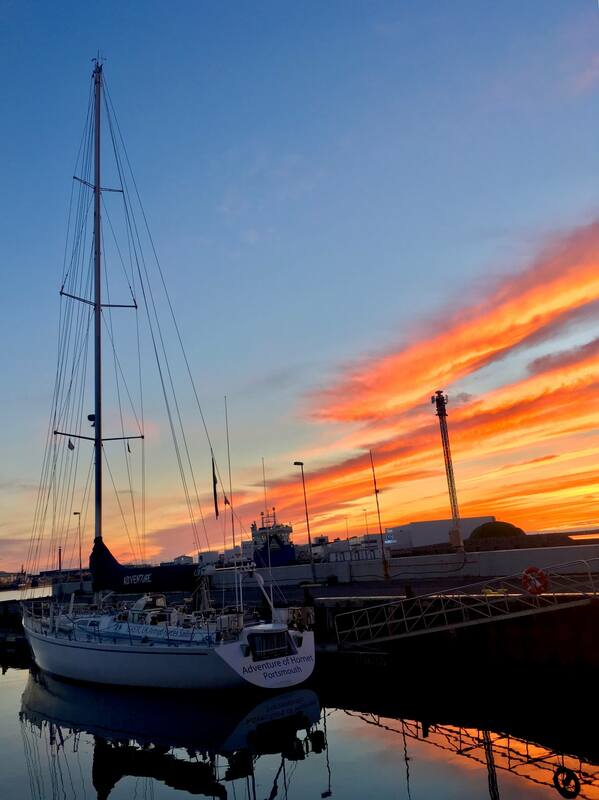 The midnight sun dims on Adventure moored in Reykjavík Harbour.